Spring is just around the corner and the summer heat is soon to follow. Now is a good time to think about some basic maintenance on your cooling and heating systems. The months of below-freezing temperatures are tough on outdoor equipment and can affect your unit’s start-up. Before you switch the thermostat to cool, Prescott Air Conditioning offers a few tips on preparing your air conditioning unit for the warm weather. Inspect the outdoor condenser unit. If the panels that enclose electrical connections are missing or misaligned, it could cause potential risks for the operation of your equipment. 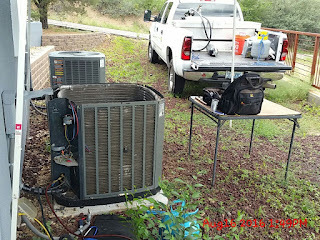 In either case, you should have a certified technician assess your cooling system before starting it up. Remove covers or lids that you may have placed on the unit to protect it from severe weather. Covers should be removed before starting the unit to prevent potential damage. Check pipe insulation, and repair or replace if damaged. Damaged insulation on the suction line (the larger copper pipe that supplies refrigerant to the compressor) can cause a loss of cooling. Insulation can be damaged by extreme weather or even animals looking for food or shelter. Check for debris around the outdoor coil. Remove any trash or vegetation the winter winds have blown into or against the coil. Debris can limit the heat transfer of the condenser coils. If your heat pump has space under it, be careful not to pack mulch around the base of the unit. Doing so could result in a blockage of air flow. Indoor air filters should be changed as they may have collected extra dust during the cold winter season. Remember to check the arrows on the filter and the unit to ensure your air filters are installed correctly. Make sure the supply and return air grills and vents are open and free of debris. It would also be good to vacuum grills and vents to remove any debris that might have accumulated. Before things heat up, have a qualified technician from Prescott Air Conditioning, your local Quad Cities service company, do a thorough inspection of your cooling system. To schedule old-fashioned, polite and on time service, call 928-308-1254.